An installation and short film by Ray Jacobs. Ray Jacobs is an artist who uses the mediums of image, film and movement to highlight the integrity and beauty of art found in the everyday. 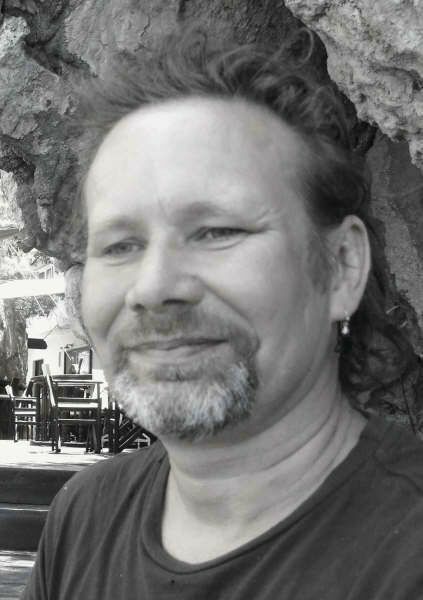 Ray is an experienced artist who has worked throughout the community over the last 15 years as a performer and director, creating imaginative and powerful works with a wide variety of companies, performers and participatory groups in particular collaborating with disabled artists. He states. ‘I aim in my work to create movement and image which steps quietly into the human heart’. A multi-layered digital work of people’s hands presented on various screens in a café environment, accompanied by a soundtrack and coasters which provide further insight into the installation. The aim was to create a harmonious art intervention with simple yet beautiful images of hands at rest, in conversation or on their own, echoing the day-to-day actions of people within the café. It was exhibited at The Herbert Gallery Coventry, Solihul Arts Multiplex and The Old Market Hall, Shrewsbury. ‘Whilst researching Charles Darwin, it occurred to us that loss and bereavement were a huge influence on his life, both as a young boy who lost his mother and as a parent who suffered the grief of losing a child. Elements of Darwin’s life also linked in with other important aspects of the project, including the importance of walking as a contemplative and healing practice, his use of stones as markers for thoughts as he walked, and the healing and nurturing effect of the landscape’. The project included: A daily contemplative walk open to the public (including the sharing of memories through conversation, writing and artwork) around the old town walls of Shrewsbury, environmental art workshops for bereaved children, and the creation of a public art piece, ‘The Remembrance Labyrinth’, made of 7000 used books, walked through lightly, thoughtfully, contemplatively and playfully at the Quarry in Shrewsbury. Ray Jacobs has exhibited digital images of figure and landscape at many West Midlands galleries including, Bishops Castle Town Hall Open Exhibition, Qube Gallery Open Exhibition, Oswestry, Church Stretton Public gallery. Working Farm Craven Arms. Examples of the work can be found on http://www.flickriver.com/photos/41605996@N03/popular-interesting/ ,where his works have received over 1 million views. Shown at Emotion Pictures, Athens, Sprout Film Festival, New York, Intergration Europe film festival you and me. Shown at ; Oska Bright Film Festival Brighton UK, The Normal Festival Prague. Focus Film Festival, California ,Oska Bright Film Festival, Brighton UK, Ablevision Ireland International Film Festival , Picture This Film Festival, Canada ,Sit Down Shut Up Watch Film , South Australia, Adelaide Film Festival. Nominated Finalist Oska Bright Film Festival. Awarded Best Film – Sit Down Shut Up and Watch Film Festival, Adelaide, Australia. Ray Jacobs is currently co director of Shropshire Inclusive Dance and Performance director at Arty Party.